Excitement over the upcoming new episodes of Futurama has spread to the knitting community, of all places. 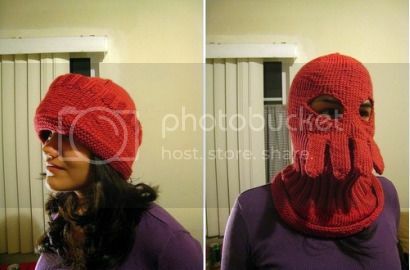 Flickr user Sara adapted the pattern for this Doctor Zoidberg ski mask from this pattern on knitty. And I have never been so delighted by knitted face tentacles. Via Reddit, who spreads its excitement all over the knitting community. But only when it’s consensual.